Hanover, October 2009. Semperit's cold-weather tyre offers superior winter suitability combined with a good price/performance ratio. With its Master-Grip and the Speed-Grip, the long-established Austrian tyre brand offers a large and alpine-proven product range. The Semperit's Master-Grip benefits from substantial improvements in virtually all disciplines. These include, for example, an innovative tread compound containing special anti-frost polymers for permanent tread pattern flexibility at exceptionally low temperatures. Explaining the crucial benefit for motorists, Heike Schöpper, Product Manager for Semperit's winter tyres for cars, commented: "This means the Master-Grip provides continuously high grip in snow and ice throughout its entire service life." Like the Speed-Grip, which Semperit has in its portfolio for luxury vehicles, the Master-Grip also features the well-proven network sipe technology used to substantially reduce braking distances on icy roads. Thanks to an increased number of lateral grooves in the shoulder section, which disperse water quickly outwards from the ground contact patch. Right from the start, the Master-Grip will be available in 33 sizes from 13" to 15". As a result, it will cover almost 99% of European market requirements in this segment. The new winter tyre is approved for speeds of up to 190 km/h (118 mph) and sizes range from 135/80 R 13 T to 175/55 R 15 T.
The Speed-Grip ensures best driving in winter, particularly in terms of lateral guidance and traction in snow, on wet and dry roads. Network sipes are the outstanding product feature on this tyre. "These provide high longitudinal and lateral flexibility, as well as ensuring good dispersion of the liquid layer created by braking friction" said Heike Schöpper, Product Manager for Semperit's winter tyres for cars, outlining the technical background to the tyre's outstanding traction in snow and reduced braking distance on icy roads. "To achieve efficient water dispersion, the Speed-Grip was also given a large number of lateral grooves in the shoulder section." In addition, the developers made the tread blocks in the shoulder more stable, ensuring that the tyre offers good handling characteristics on dry roads too. To achieve this the network sipes in the shoulder section are surrounded by a supporting wall. 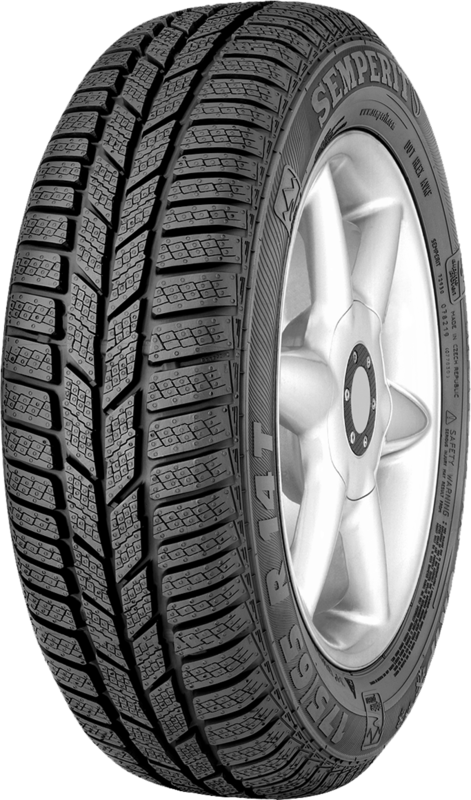 The specialists at the magazine 'Auto Zeitung' (issue 20/2006) tested this winter ace in the size 205/55 R 16 H and their expert opinion was 'highly recommended'. The Speed-Grip is available in 49 sizes for 15" to 18" rims. Semperit's dedicated winter tyre is approved for speeds of up to 240 km/h (150 mph), depending on the model. Sizes range from 175/65 R 15 T to 225/40 R 18 V.
Semperit is a tyre brand of Continental AG. With sales exceeding €24 billion in 2008, the Continental Corporation is one of the top automotive suppliers worldwide. As a supplier of tyres, brake systems, systems and components for the powertrain and chassis, instrumentation, infotainment solutions, vehicle electronics and technical elastomers, the corporation contributes towards enhanced driving safety and protection of the global climate. Continental is also an expert partner in networked automobile communication. The corporation currently employs approximately 133,000 at nearly 190 locations in 35 countries.